← Are the canyon gods trying to tell me something? This trip was conceived in a casual conversation with Christine. Me: “I wouldn’t mind seeing the Northern Lights”. Christine: “ok, let’s do it”, and next thing we knew we had a date set and had invited a few other friends, Jane, Lynn, Ashild and David. I maybe should have done a bit more research about the Northern Lights! Apparently, the colours can’t be seen by the naked eye, it’s when the phenomenon is photographed digitally with time exposure that you can see those amazing colours in the photos. This is what the naked eye sees. This is what is captured with time exposure. If the display is very strong (as it was in the photos above), you can see “something” but not the really bright colours that you see in photos, so, the trip was different to the experience that I was expecting … but I’m getting ahead of myself. The trip started with Christine (my fairy godmother) and me fronting up to Emirates First Class Lounge at around 4pm. I ate far too much and drank heaps of champagne before getting on the flight! 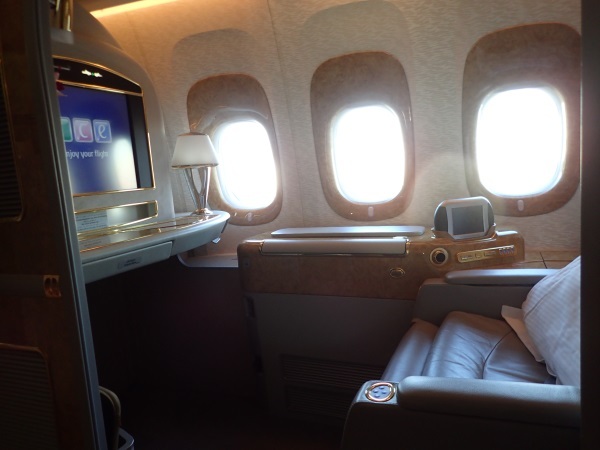 First class travel (on Emirates), is AMAZING, I will have to restrict myself to overseas travel only once every 10 years, cause once you do first class, it’s really hard to go back to economy! Champagne on arrival, your toiletries bag and pj’s handed to you, big screen TV, drinks bar under the window, recliner that flattens out to a full-on bed, then they put a mattress on top of that, then a doona and lovely pillow. Noise reducing headphones come with the suite! You watch TV until you’re ready to sleep then close your doors and sleep until they wake you up with breakfast, followed by shower to freshen up! 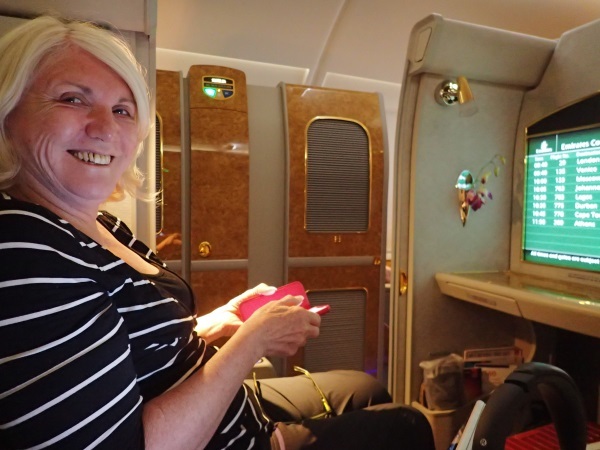 Christine in her first class suite, note the little vase on the wall with purple orchids in it! Mine was beside hers with a barrier between us which you could elect to raise or have lowered. After our 14.3 hour flight Sydney > Dubai (another stop in the first class lounge) and then 7.15 hr flight Dubai to Oslo, we changed to SAS for our 1.50 hr flight from Oslo to Tromso (Norway). Here we’re at Oslo watching an Emirates plane getting the de-icing treatment before take-off. 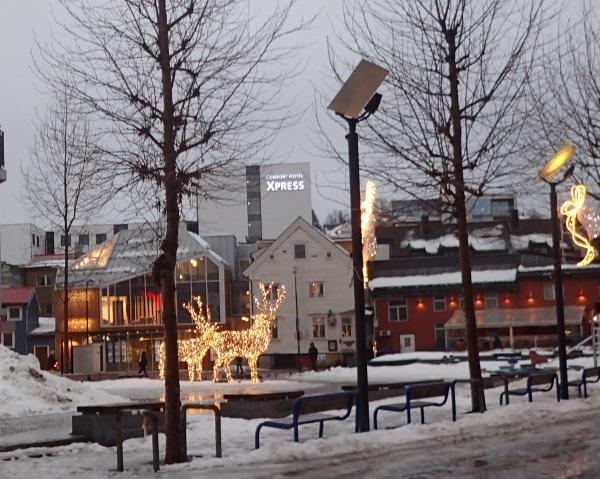 We met up with Ashlid and David in Oslo, then when we arrived at the hotel in Tromso, met up with Lynn and Jane. 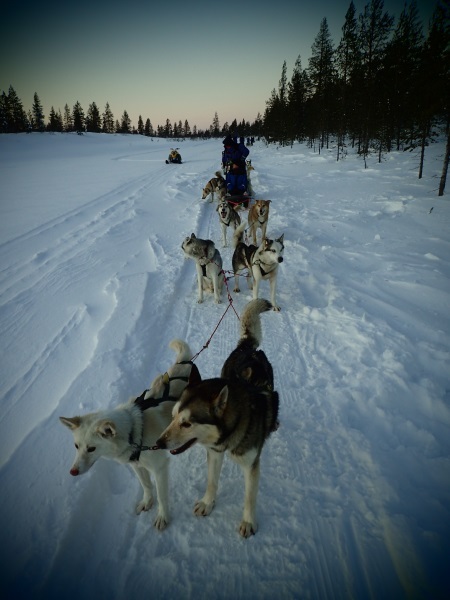 We checked in at the hotel then we were picked up at 6.45pm for our Northern Lights Chase by Bus, a small group of about 12 in a mini bus, driving out of the town into the night, and driving, and driving, and driving, seeing nothing but black skies. Then the bus pulled over, still seeing black skies but the guide started taking photos of people by the side of the road. And once he took the time exposure photos, the lights were revealed. Jane and me with the lights in the background. The yellow blobs are clouds that have been lit up by the light from the town about a k away. It was really, really cold, all we could see was a faint white “cloud” where the camera picked up the green. We didn’t think much of this “display” after all we had another 2 weeks of northern lights to see, little did we know that this, on our first night was as good as it got. David took a couple of shots over the next two weeks but the display wasn’t half-way is good as this one. We were all keen to get back to the hotel for a good night’s sleep. Breakfast next morning was FANTASTIC, and then we were picked up for a walking tour through Tromso. We started the walking tour by sticking to areas which weren’t too icy, even though we had good boots, the roads were treacherous. It was 12pm but the light made it feel like it was 5pm, all through the day all the buildings were lit up. 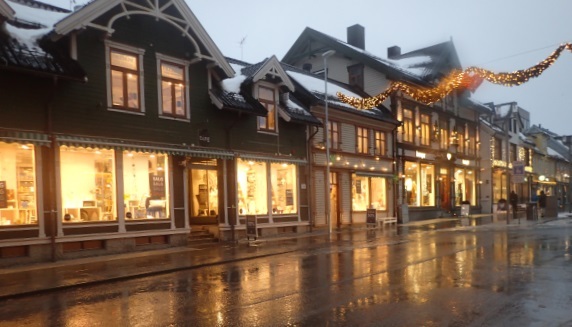 When we got into the middle of town, we were spoiled (and lulled into a false sense of security) by the fact that the main street had underground heating so the snow/ice had melted and it was easy walking around town. I thought this would be the norm, but this was the only town that we visited that had heating to get rid of the ice snow. Our guide took us to the Polar Museum in Tromso which had an incredible exhibit dedicated to Roald Amundsen, detailing his many expeditions to both the South and North Poles, truly fascinating stuff, we could have stayed there for a few hours more reading about this amazing man. After we’d had our fill of the Museum, we made our way back to the hotel and settled in for a few cocktails (even though it was only mid-day), waiting for the time when we had to make our way down to the Port for the next leg of our trip. 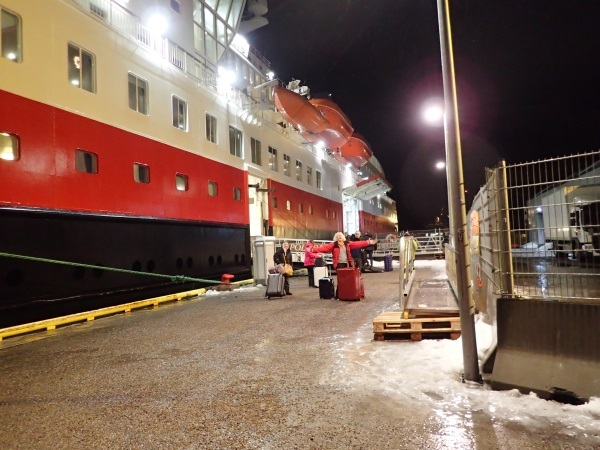 Here’s Christine as we get ready to board the Polaris for our Port to Port Hurtigruten voyage from Tromso to Kirkenes. 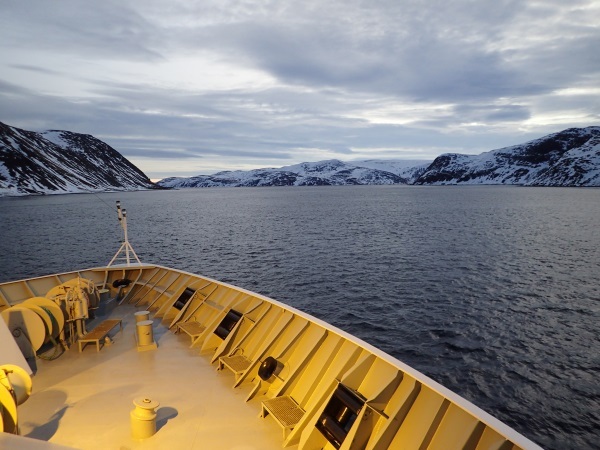 The Polaris is a working vessel, making its way from port to port along the coast and into the fjords dropping of people and goods. The cabins were on the small side, but the vessel was quite old, so they were in keeping with the age of the ship. The dining room however was wonderful, great food and as much as you wanted to eat. As we were getting ready for this part of our trip, it occurred to us all that we were not going to see the sun from now on … I think I commented “What was Ally thinking, booking us on a boat when it would be dark the whole time and we wouldn’t see anything?” I didn’t realise that whilst you don’t see the sun, and the days are very short, you spend most of the day in a “twilight” and you can see the coast! We were well above the tree-line so it was barren hills, snow and water! You could sit in one of the lounges in front of the picture windows and admire the view. 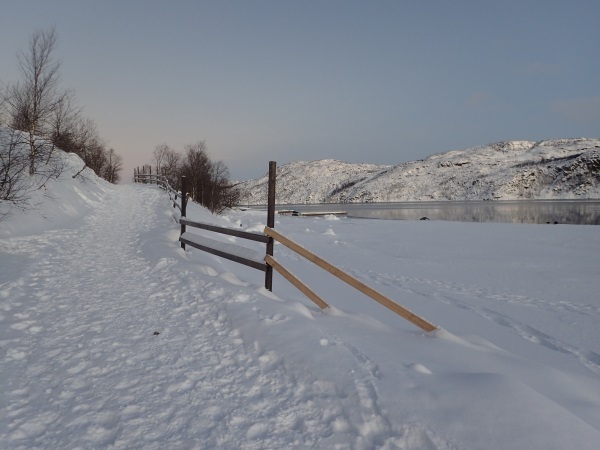 The route of the Polaris, Tromso on the left and Kirkenes on the right. 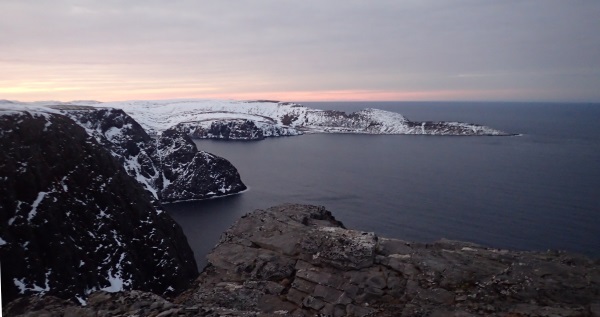 Murmansk (Russia) just over the border. Then we drove down to Inari and Rovaniemi (leaving from there). 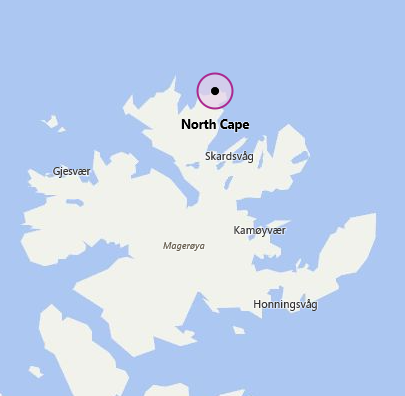 Half-way to Kirkenes on the second day, we stopped at Honningsvag and took a tour up to the North Cape. 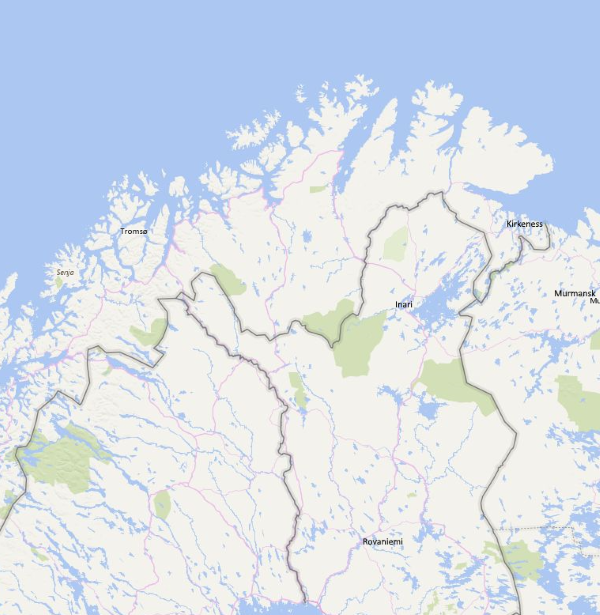 This is the northern-most part of Norway and Finland. It’s around 11am and this is the closest that we came to seeing the sun whilst this far north. 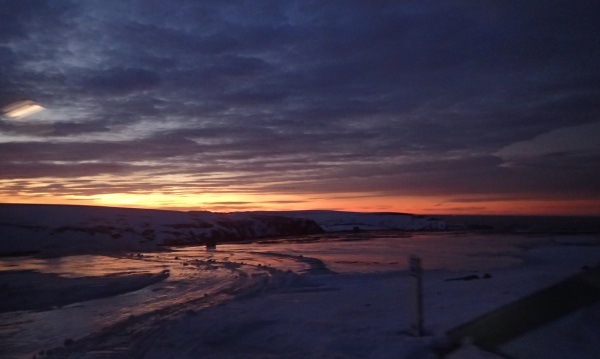 On the road out to the North Cape, the buses all had to meet up at a locked gate (with a guard) and then proceed in convoy behind a snow plough out to the cape. It was like driving across Siberia, windswept hills and snow! 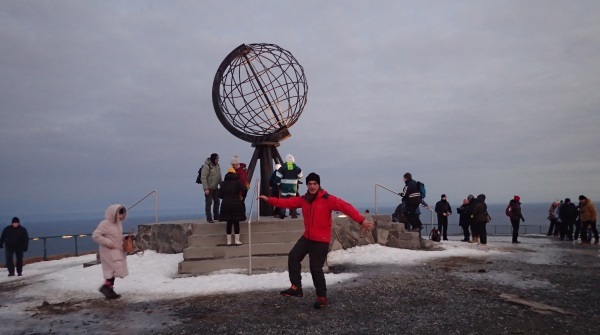 David posing at the cape, nothing between here and the Arctic ice cap. Lots of tourists though and very windy and cold. The view from the cape … we’re still above the tree line! Apparently in summer it’s a haven for trekkers, I couldn’t see the attraction though, no trees, there were probably nice grasses but that’s about, and if you walked down to the sea, you wouldn’t want to have a swim! Back on the bus and on our way back to the boat, we were fortunate enough to see this beautiful “sunset” although the sun hadn’t popped up above the horizon all day. 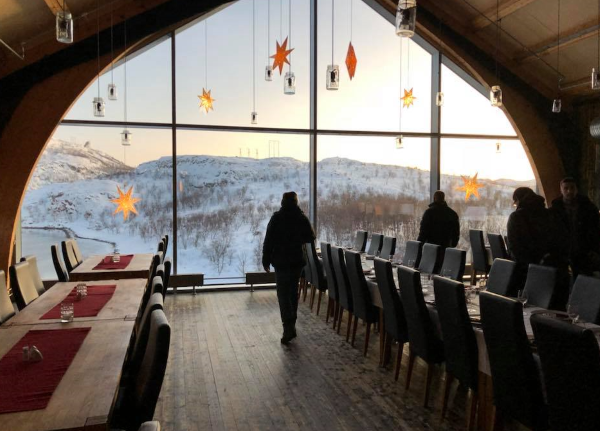 The Polaris landed next morning at Kirkenes and we were loaded on a bus for the short drive to the Kirkeness Snowhotel. To say that it was “cold” or “freezing” doesn’t quite cover it, the temperature was around -13°F. Fortunately we didn’t have to drag our bags along once the bus dropped us off, but it was a 100m walk from the front gate to the “hotel”. 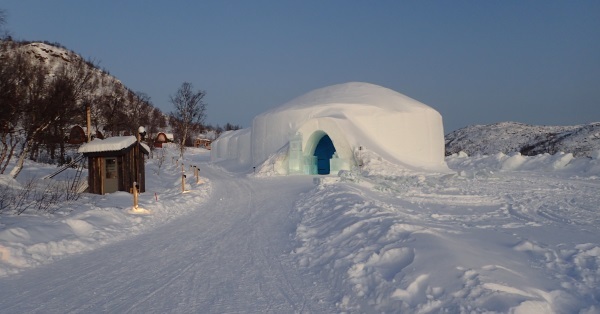 This is the entry to the “Snow Hotel”, the first room is an Ice Bar and then there’s a long coridoor with “rooms” off each side. In the distance you can see the building with the restaurant in it. 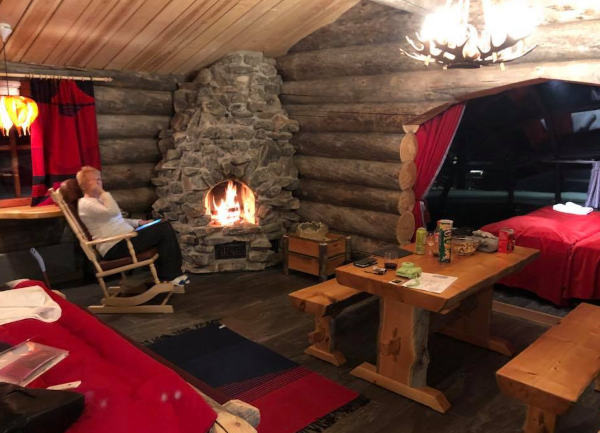 The property brings tourists in all day to tour the “hotel” and then at the end of the day, around 8pm, you are taken to your room for the night. 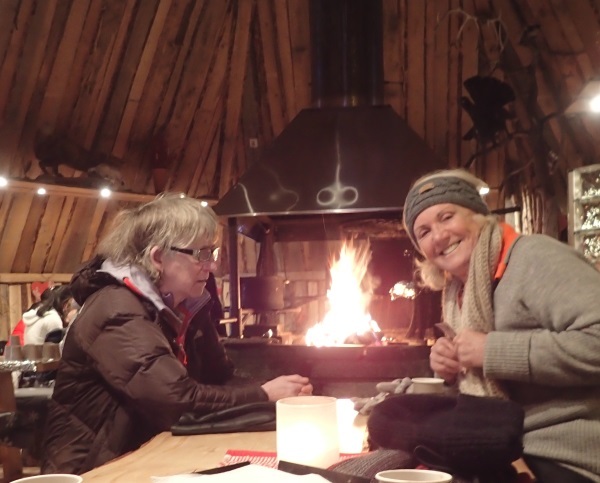 Christine and Ashild having a hot drink in a Sumi (Lapland) hut whilst waiting for our next tour. 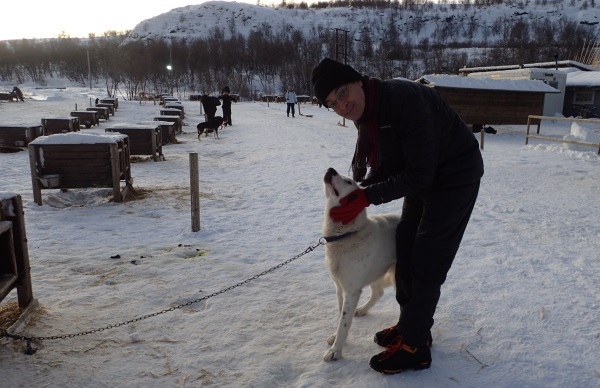 David and I took a walk around checking out the huskies (there re lots of them) on the property. We also found a nice walk along to the pond/lake that the hotel is on, the snow was about knee deep off to the side. 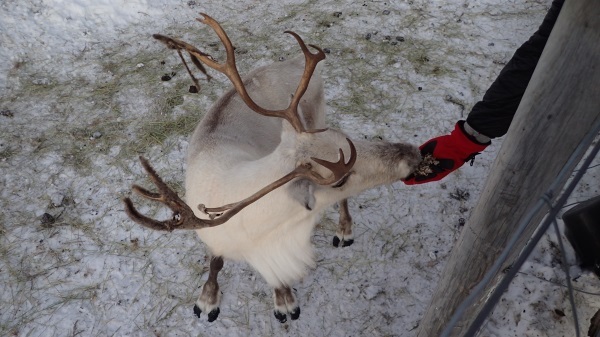 And we found a reindeer to feed – they have buckets of litchens that you can feed to the reindeer. David and I got sick of waiting around so we took a peek into the “rooms”. 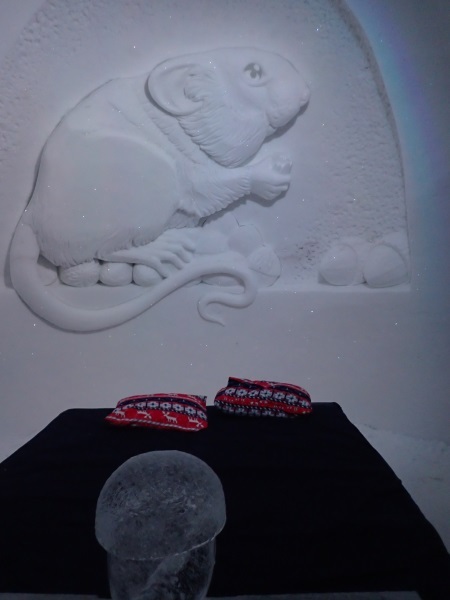 They are hollowed out snow domes and all the walls have different carvings on them. The “beds” are ice with a bit of a foam mattress on the top and you are given a heavy duty sleeping bag to sleep in. You aren’t shown your room until after dinner (around 8pm) and all your luggage is kept in a regular building (which also housed, showers, toilets and a dining room which is where we had dinner). This is the room that David and I ended up in, which had a squirrel on the wall and an acorn on the bed head. It was all well and good until you had to go to the toilet in the middle of the night and then I had a 100m walk through the snow coridoor to the toilet. I didn’t sleep all that well and the third time I had to get up (around 5am) I decided not to go back to bed, just too cold getting up each time. 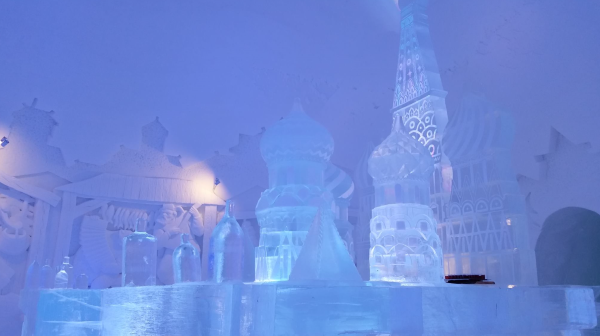 This is the Ice Bar with no-one in it, again, it’s a dome but all the walls have carvings and there are carvings on the bar. The chairs and tables were ice, but frankly, too damned cold to sit down for a drink, it was mainly just for show. 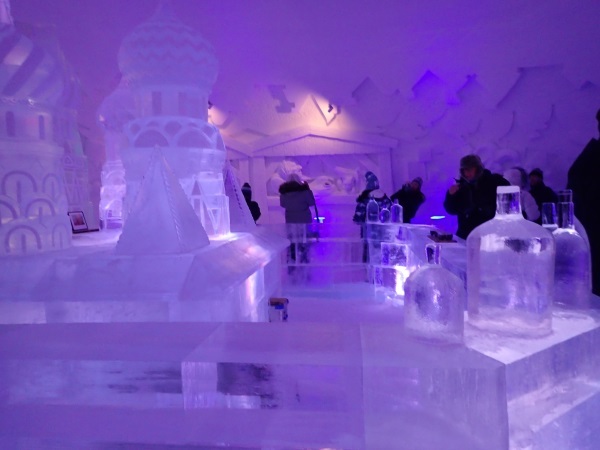 Here’s the Ice Bar again with people in it. They didn’t have alcohol here to serve they brought out shots of fruit juice, but in glasses, not the ice martini glasses that I’d envisaged. By now we’ve been at the Snowhotel since around 10am and we had to wait until 1pm to be picked up for our Arctic King Crab Fishing Safari. It was only 1pm but it was “sundown”. A bus took the six of us to the tour operator and she kitted us out in anti-exposure suits and helmets. 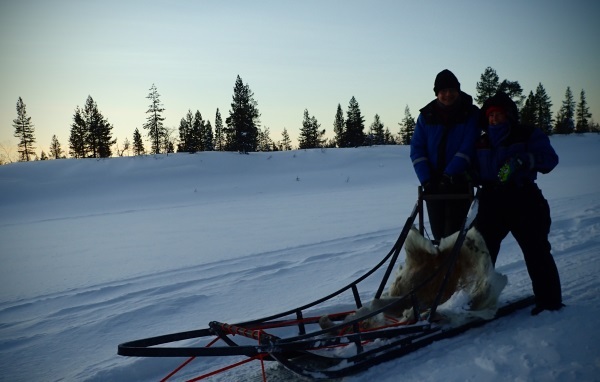 We were then loaded into a sleigh and a snowmobile took us out onto the frozen fjord where the holes had been cut to drag up the crab traps. 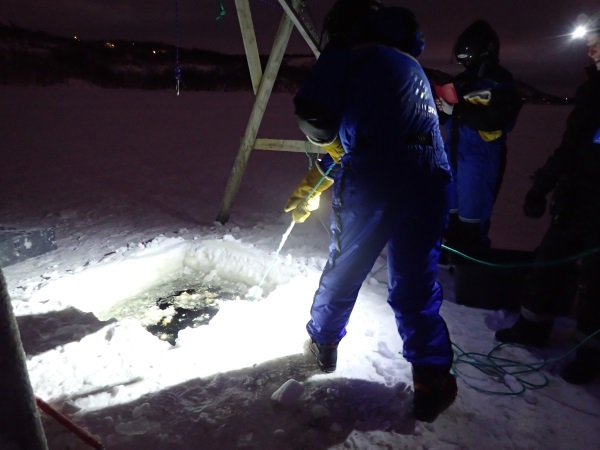 The ice hole had frozen over and the tour operator had to break up the ice with an axe, then David (the token male) was given the job of dragging the trap up. 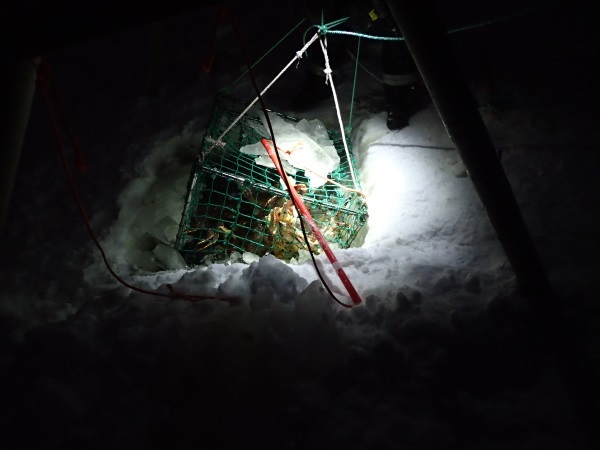 The trap emerging from the ice hole with the crabs in it. 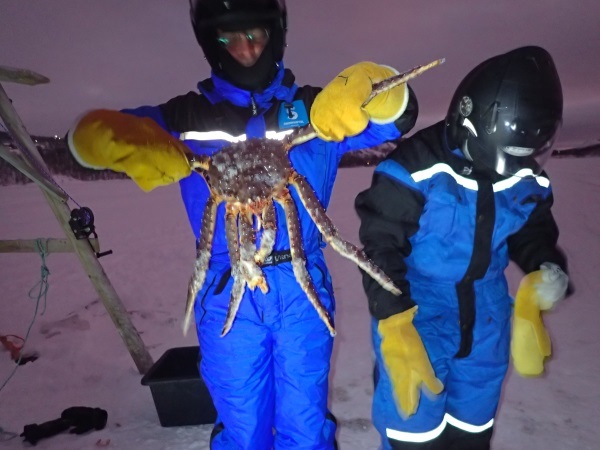 An Arctic King Crab. Apparently these were introduced to the area by the Russians, but no-one’s complaining. There is a quota of how many can be harvested. The tour operator had to kill the poor thing (knife in its head), then cut off all the legs and throw the rest back in the hole so the other crabs could feed off the carcass. We then hopped back in the sleigh and back to the building where a lovely dining area had been set up. The crab legs came out and I’ve never seen so much crab meat, absolutely delicious! The only thing missing was a nice glass of wine. So back to the Snowhotel and it’s only 5pm and we have to have dinner first (lovely dinner but we were so stuffed with crab meat that none of us could do the dinner justice). 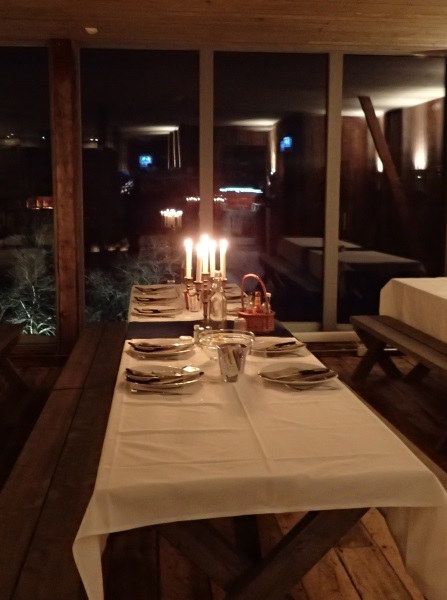 This is a shot of the dining room, great outlook but by the time we sat down it was pitch back outside! Then we had to wait around until 8pm when we could go to bed. 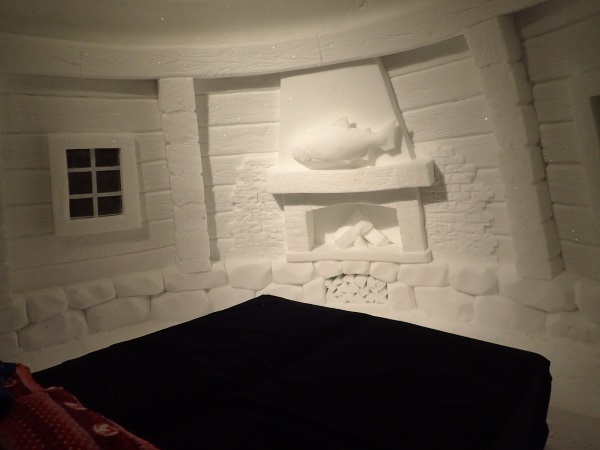 Can’t say I was a huge fan of the Snowhotel, it was nice to do it once, but wouldn’t want to do it again, too far to walk to the bathroom! Plus, I came down with a cold the next day which was a bummer! We were picked up around 9am for the 6.5 hour drive to Inari, our next stop. We had a very nice driver but he didn’t point out much of interest on the way. By now I’m coughing quite a lot so not all that interested in anything other than going to bed. The hotel was rather quaint and the dining rom was right downstairs. I dragged myself off into town (about a 1k walk), looking for cough medicine and tissues, then back to the hotel for fabulous dinner plus wine. In all Inari was a good experience, not much there though. We were picked up around noon and had a few hour’s drive down to Kakslauttaen. This was the best shot I got of Reindeer, the bus didn’t stop for photo opportunities. At one spot when I looked in amongst the trees there must have been 50 of them just chilling out snacking on litchen. With all 6 of us in the one cabin, this accommodation could have been challenging. 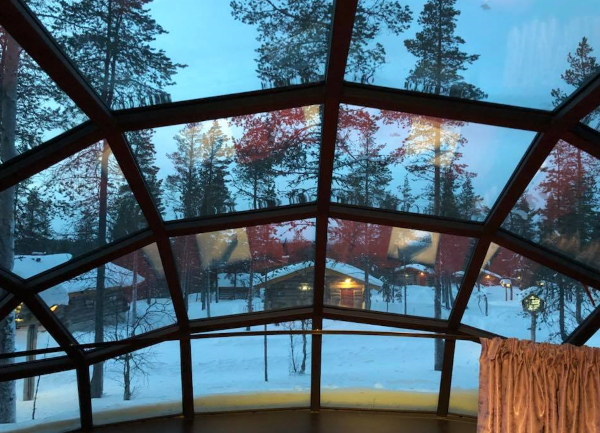 This shot is the glass igloo roof above one of the beds. Obviously it’s marketed as you being able to lay in bed and watch northern lights (if you could see them with the naked eye! ), The downside for me, as by now I’m quite sick, is that it was a 200m walk over snow/ice and up/down icy steps to get to the dining room for dinner and breakfast – they really could do with some of that heating that we had in the Tromso streets on the icy steps, would have been so easy to do! The “living area”, you can see the igloo “bedroom” and another bed in the bottom lh corner, I had the bottom of a bunk bed, poor David as the only one who was capable of climbing the ladder had another “bunk”, with absolutely no headroom, he managed though with hardly any grumbles (but possibly lots of negative thoughts). David on fire duty. When our wood ran out he purloined some from a wood pile that he discovered. 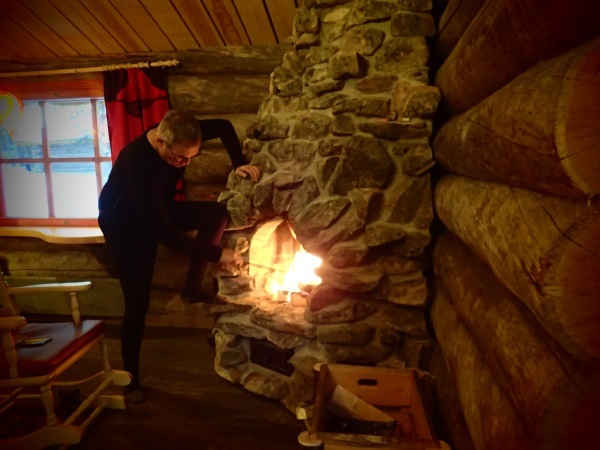 The room had a sauna in the bathroom and David and Lynn took advantage of it. 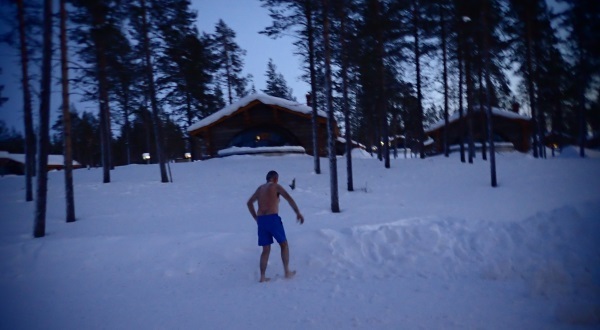 Then they decided to go outside and walk around in the snow – an authentic experience! 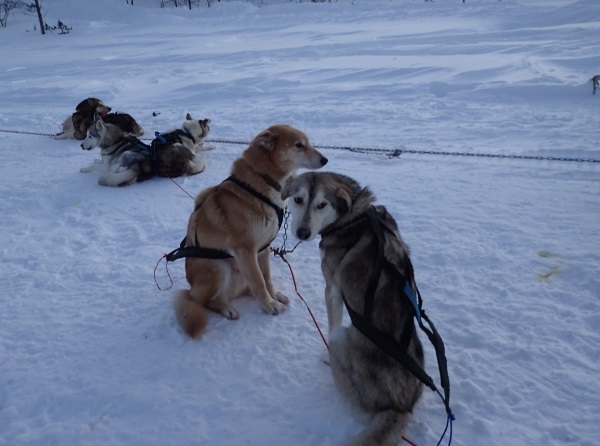 Next morning we went on a “Husky Safari”. David and me doing the change over of “drivers”, I only drove for a short while before having trouble negotiating a turn, throwing David out of the sled and me being propelled into the thigh-deep snow. I decided that he was better at it than me. The view I had while David was driving. 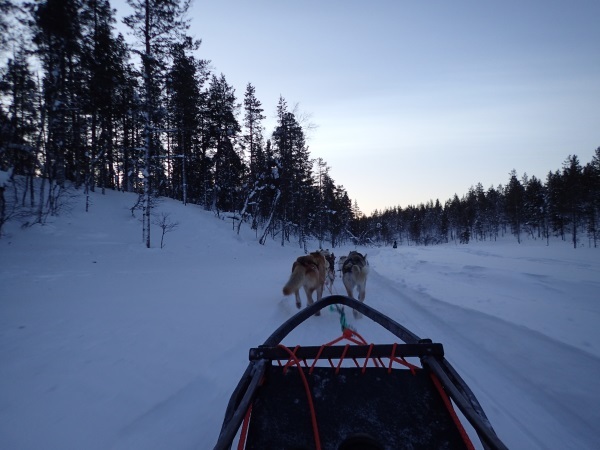 It was rather entertaining, the dogs would be running along and then one of them would turn his head aside and take a big mouthful of snow, or one of them might decide to go to the toilet – and they just did the deed while still running along. 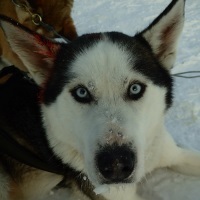 Our dogs were really well behaved, some of the other dogs got into fights and had to be put in another team. Our team was the first, David recons it was because our team were “the best”. We’re far enough south now that we are getting glimpses of the sun, it looks like it’s sunset but in actual fact it’s 12 noon! 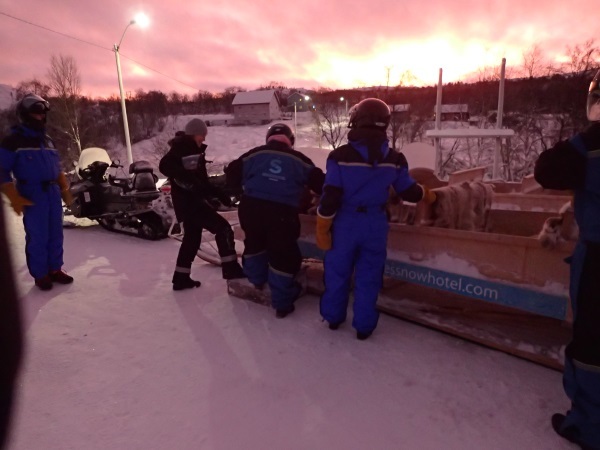 It’s now 7.30pm on the same day and it’s time for our Aurora Hunting by Snowmobile. I’m not feeling great and so am not up for driving a snowmobile (by myself) for the first time, so I opt to be dragged along in a sleigh (along with Ashlid, Christine and Jane). We were rugged up in anti exposure suits, helmets etc, it was warm enough, but half way through the tour I really wanted to go to the toilet, but didn’t figure I could get all my clothes off to actually go, so I was in agony as we were dragged across the tundra and bumping over corrugated trails. 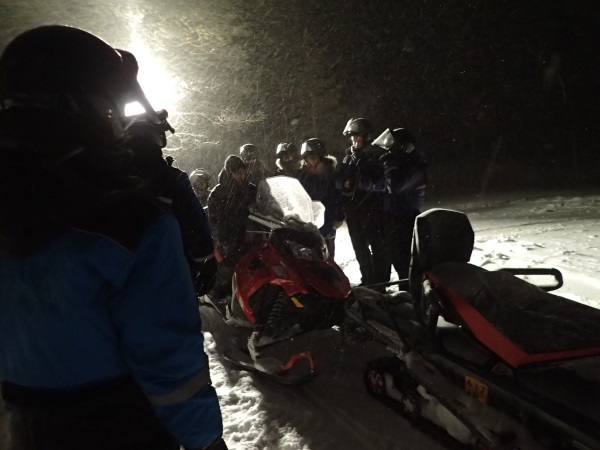 PLUS, I’m right behind the snowmobile pulling us and breathing in all the fumes – not happy Jan! 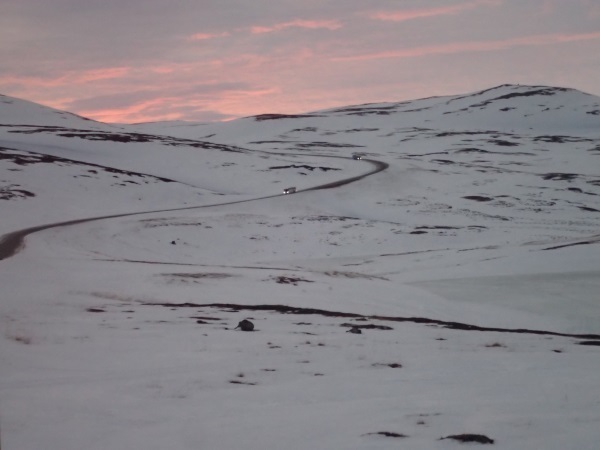 The barren tundra that we were driving around on. 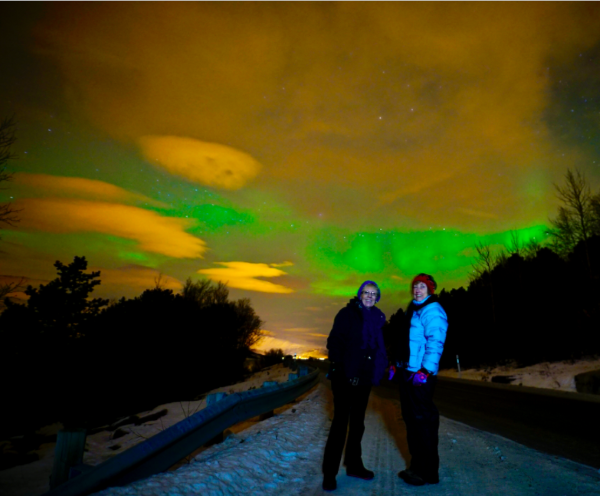 And Aurora Hunting, give me a break, it was cloudy and looking at the Northern Lights App on David’s phone, the chance of seeing any northern lights were about 10%. And it was bloody freezing and windy. Coupled with the fact that I was getting sicker and probably shouldn’t have gone in the first place – I wasn’t a happy camper. By now I’m almost in panic mode and the driver made the mistake of saying “we’re just looking for some northern light action”, thankfully my words “THERE’S NOTHING OUT THERE!! !” didn’t travel too far (despite me actually yelling them), if it had only been us I would have gotten the driver to turn around but there were a dozen other people on the tour. I’ve never been so glad to end a tour and get back to the toilets (which I might add were very civilised and clean). 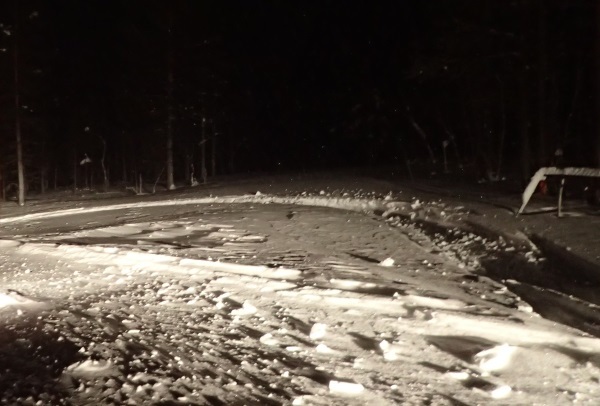 So I didn’t have to walk the 300m through snow and ice when we got back to the accommodation, I persuaded the person who drove us back to the resort to drive us right to our door, well, they weren’t great directions that I gave him (a little ambiguous), but we got there eventually after a “slight” detour. I’ve never been so glad to climb into bed! Next morning I was so sick that I stayed in bed and David brought me some breakfast, then refusing to walk the 200m over to reception in the cold (snow and ice), arrangements were made to pick me up and drive me to reception to wait for our next transfer. 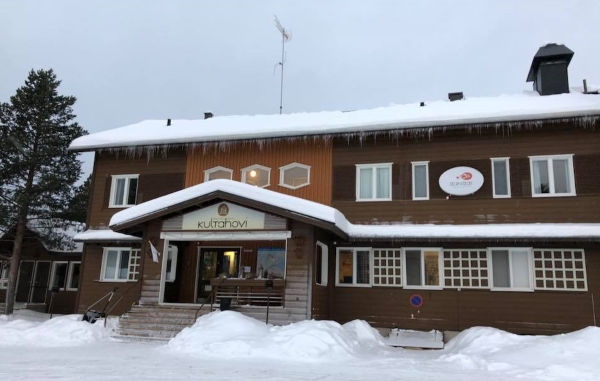 The next three days were a bit of a wash out for me, by the time we got on the bus to go to Rovanemi, I had a temperature, really bad cough and figured I had a respiratory infection. I dragged myself into Reception to register and then dragged myself up the steps to our room (which I might add was lovely). My temperature was raging now and I only just made it into bed and that was the end of me for the 3 days. 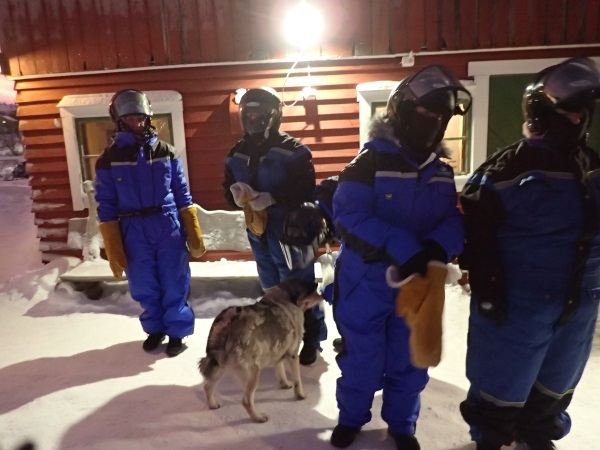 The others went on another Husky Adventure – which they all agreed was the best thing they’d done, and then they visited a Reindeer Farm which also was really, really good. I laid in bed with no room service and no phone to order any food, so I was dependent on David. I dragged myself out of bed for a wonderful dinner on Day 10, but had absolutely no appetite and didn’t want to drink much alcohol because of the antibiotics I was on. The very thought of going outside into the -25°F freezing cold and walking the 100m to the dining room was enough to make me physically ill. Eventually, I dragged myself out of bed and walked one way to the dining room then organised to be driven back to our room after breakfast (or dinner). This accommodation wasn’t really set up to accommodate anyone who was sick (or elderly or handicapped), I’ve come to the conclusion that tourism in the north is in its infancy, everything was brand spanking new, but some work needs to be done on logistics. Needless to say, I’ve never been so pleased to be driven to the airport and getting out of that god-forsaken snow, ice and cold! I think Christine was a little nervous about my horrible hacking cough when checking in to the airline so I was given instructions not to cough at check-in or they might decline us! So, on the 21st we said goodbye to David (who was off on a Porsche snow driving adventure), Jane (going back to Australia) and Lynn (going back to the UK). I wasn’t sure about a group of 6 people travelling together for so long, but we all got on really well, and each person complimented the group, I think if it had just been Christine and me, we would have soon gotten bored with each other’s company so it all worked out well. 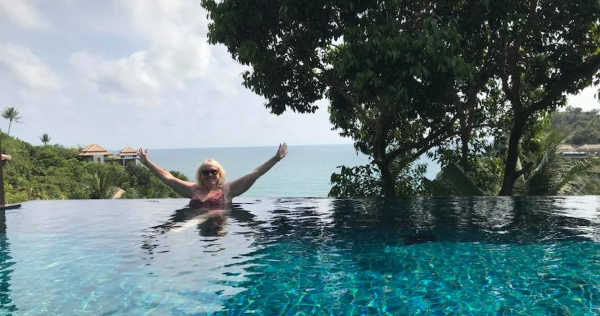 Knowing that we’d be sick of the cold, Christine had organised a few days in Ko Samui, an island off the Thai peninsula. 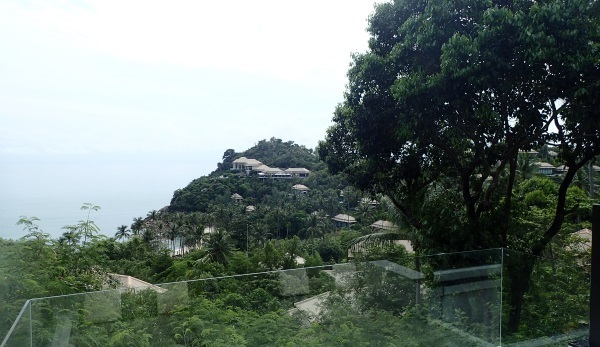 We arrived around mid-day after a long flight Rovanemi > Helsinki > Bangkok > Samui. By now, Christine is the sick one and she’s sounding far worse than I ever was. The first thing we did was organise a doctor to come and see her to get her some serious drugs (antibiotics). 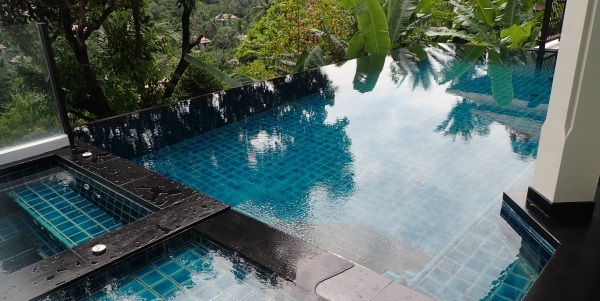 We spent our time lazing around the villa, this is a shot of our beautiful horizon pool, which sadly I couldn’t go in because of the wounds on my legs (still not healed). 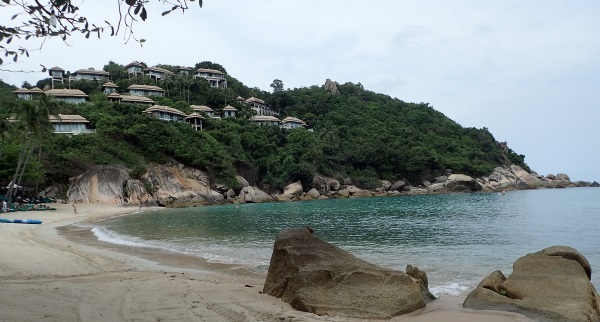 The view from the beach, we were in one of the villas on the mid level. Looking across at Reception (at the top of the hill and where we had breakfast each day) from our villa. 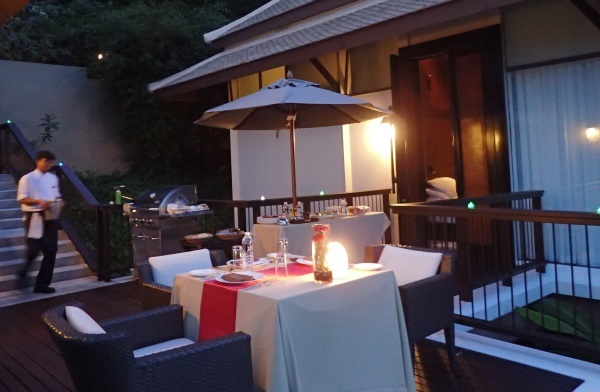 The resort is owned by Chinese and caters mainly to Koreans and Chinese. No expense in the fit out of the rooms was spared and you just had to ring reception to order a buggy to pick you up to go to breakfast or dinner. As Christine was so sick, we didn’t go far for the first few days and then took advantage of the buggies to get around at the end. 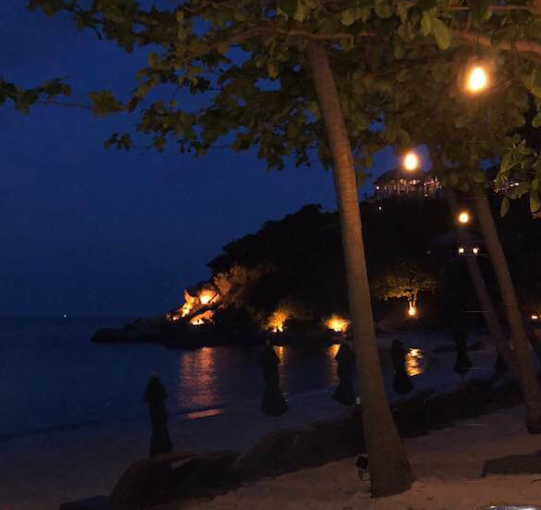 On our second night Christine was well enough to be driven down to the beach for dinner at one of the Resort’s restaurants – luxury! 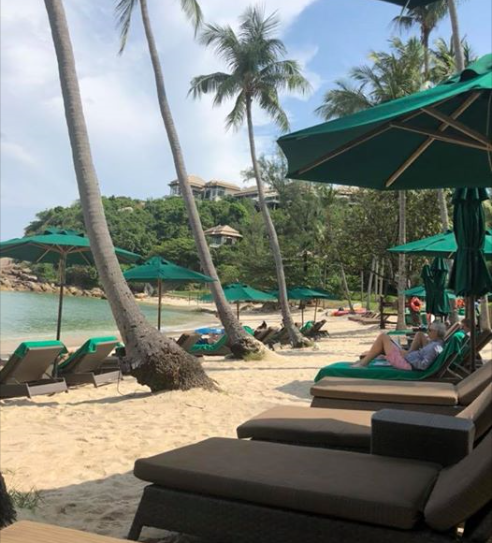 The next day we all took a buggy down to the beach again and had a cocktail and spring rolls whilst watching others frolicking in the water, and the Chinese/Korean girls taking endless “selfies”. The antibiotics (or whatever the Thai doctor had prescribed for Christine) have finally started to work (her cough was still horrific), so she braved a swim in the pool. 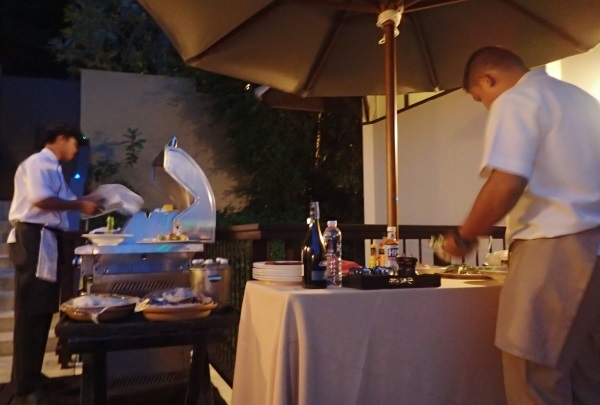 Our final night and Christine had organised a seafood bbq at our villa. Christine still had no appetite and Ashlid eats like a sparrow, so I felt that I had to eat more than my fair share – the food was fantastic but by the end of dinner I could barely move! The setting for our BBQ. Christine’s one bedroom villa (Ashlid and I were in the master suite) on the right. So, the holiday drew to a close with our flight back to Bangkok and then Sydney. We were travelling first class again (thank you Fairy Godmother), and spent a few hours in Bangkok’s Emirates First Class Lounge. I drank lots of champagne and grazed on the wonderful food whilst we were waiting for our flight. Two movies later, a few hours sleep and a shower and we were landing at Sydney, sooooo pleased to be home! It wasn’t the trip I expected, but given the obstacles it was a wonderful holiday away, thanks Christine for putting the wheels in motion for our thoughts to become a reality. Thank you M very good report on a truly fascinating trip. Yes, Roy, it was fascinating! Some fair observations there. I think you would have a better impression of the trip, in hindsight, had you not been so ill. Thanks for sharing this adventure with me. You really are a great and compatible travelling companion! I hope that you get over your new found hatred of snow and ice! Yes, I agree, I haven’t been that sick in years (and years), bad enough being sick when you’re home, horrible when you’re travelling! Thank you, you too were a compatible travelling companion. Not likely I’ll get over the aversion of snow/ice! But I guess it’s like childbirth, memory will fade away eventually! Sad you were so ill M – changes everything when every day is a struggle. So we’re not camping in the Aussie snow this year?? Yes, First Class is pretty cool, doubt I’ll ever get the chance again though! Both Christine and I are well now, so all’s good.